Just $250 Per Year Can Help. 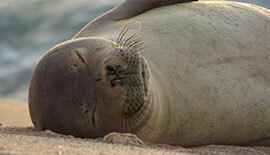 Your donation lets you symbolically adopt one of several special Hawaiian monk seals. You and other caring individuals then become the “parents” of your chosen seal. If you know of a specific seal that you want to adopt that isn’t listed below, please let us know HERE and we will do what we can to support your request. An HMAR official Hawaiian monk seal adoption certificate that you can print and proudly display at your home or office. “Members-only” or early invitations to special HMAR events. Links to digital photos of your adopted Hawaiian monk seal to use as your computer desktop, phone screen, e-mail signature, hundreds of uses. Things we know: Benny was born on Kauai in 2004. He had a hook surgically removed in December 2014 and another in October 2016 and has had several other hooks removed. He was captured and brought to NOAA facilities from January 23 to January 26, 2015 to avoid an oil spill at Kalaeloa. 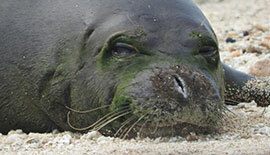 Benny is a well-known Hawaiian monk seal on Oahu and is waiting to be adopted by you. Regular haul-out areas: Turtle Bay, Kaena Point, Kahuku and other Oahu north shore locations. Things we know: Holokai was born during the summer of 2015 at the Keiki Beach at Turtle Bay. 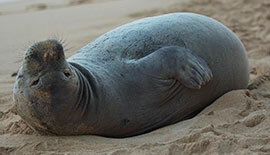 After weaning, he was often seen resting at his birth beach. As he got older, however, he has become a true “sea farer” and is seen all over the northern area of Oahu. Holokai is a cute sub-adult waiting for you to adopt him. Things we know: Honey Girl is a large female and is considered by many to be the Hawaiian monk seal matriarch on Oahu due to her giving birth to 10 pups over the years. She has pupped in 2005, 2006, 2008, 2009, 2010, 2011, 2012, 2014, 2015, 2016 and 2018. Several of her pups have not survived. She has had fish hooks removed in 2003, 2012 and 2016. Honey Girl is a real survivor and would love to have you as a parent.